In today's post, I'd like to finish up our study of Greek words by looking at phaneroo. This word means to reveal or to manifest. It is often used as a synonym for the word apokalupsis. Phaneroo indicates Christ's "appearance in the world." To gain an understanding of how this word is used in the New Testament, let's look at a few verses detailing the First Coming of Christ as a babe in a manger. Just a quick reading of these verses shows that the basic idea of phaneroo is Christ coming in the flesh. He is visible to all. He is seen by all. Now let's look at a few verses connected with Christ's Second Coming. We don't get our glorified bodies until the Revelation, the Manifestation, of Christ. We appear "with" him in glory. He is also appearing "in glory," and we are appearing "with" him. Why doesn't John talk to his 'little children' about the Rapture? Why does he point them to the Revelation instead? When do we become like Christ? When he is REVEALED, MANIFESTED. 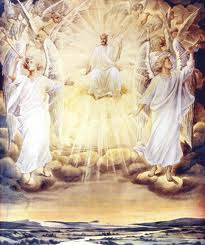 This is the Rapture AT the Revelation. It can be nothing else. This is not what the pre-Tribulation Rapture teaches, but it is what Paul and the apostles taught.